Kumar Mallikarjunan is a Professor at Virginia Polytechnic Institute and State University in Blacksburg, VA. He has been involved with the USAID funded peanut projects for almost 20 years – formerly with the Peanut CRSP and now with the Peanut & Mycotoxin Innovation Lab. He is currently the Lead Scientist on the Mycotoxin Detection Options project, a comparative study on analytical methods for detection of aflatoxin. In addition, he is a collaborator on both the Ghana and Southern Africa Peanut Value Chain Interventions project. Would you tell me about your current lead project? With the Mycotoxin Detection Options project we are looking at determining which detection system is optimal (cost, accuracy, repeatability, sample preparation time, and analysis time) for mycotoxin detection in samples collected by the scientists in PMIL and other projects who are testing peanut and peanut products. We would like to see standardized testing protocols across all of PMIL’s programs and develop an information Booklet and Web-based recommendation app. I developed a technology called the Fourier Transform mid-Infrared Spectroscopy (FTIR) while working in Uganda and Kenya with Dr. Hande Kaya-Celiker (Virginia Tech) and Dr. Archileo Kaaya (Makarere University in Uganda). It is a non-invasive reflectance apparatus and uses either attenuated total reflectance (ATR) or photo-acoustic spectroscopy (PAS) to identify and separate infected peanuts. It is based on spectral characteristics of infrared radiation on peanuts. I needed to verify this new testing technology against the current methods used by partner institutions in Uganda and Kenya. So I purchased some peanut butter from the supermarket and we split the sample among all three labs (VT, Makarere University and ICRISAT) did the aflatoxin analysis. The results from VT showed that the sample had a high amount of aflatoxin (7000 ppb). When compared with other labs, we had a wide range of results: One lab reported 7500 ppb and another 20 ppb. It turns out there were no standard procedures being followed for aflatoxin testing amongst the labs. Sometimes it was a problem with the way the samples were collected. For instance, the scientists will go to the field to sample, and then they just put the peanut samples in a bag and leave it in their car. Let’s say it is Friday and they wait until the next Monday to take them out and mold has already grown. How do we know if the rest of the samples are contaminated or the mold/toxin levels represents the data collection point? Other times, there are no communications with the lab or there will be long delays in getting results. In some cases, there is lack of trained technicians to run the equipment properly or lack of supervision from trained technicians on the person doing the testing. 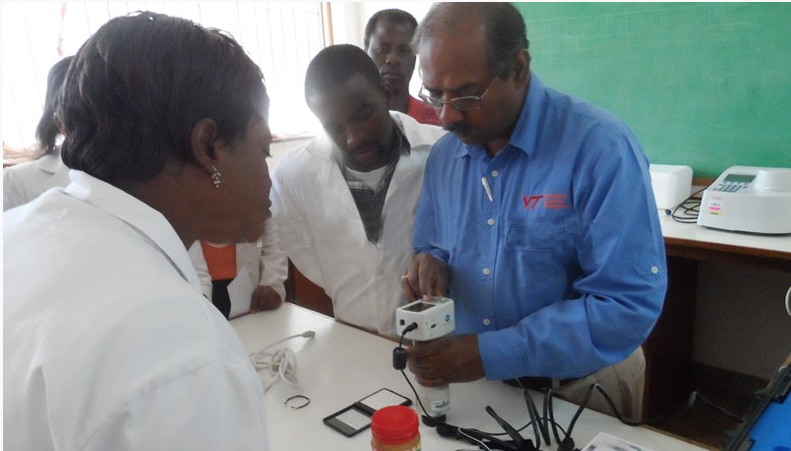 What do you see as an ideal situation for aflatoxin testing? Ideally, I’d like to see a standard operating procedures and standard safe operating procedures established for the labs participating in the PMIL program. Right now there is no certified lab in the region and many organizations send samples to Europe for testing the samples. To start, we are working on a comparative survey of techniques being used in the labs. Virginia Tech has prepared peanut samples (peanuts, peanut butter, peanut flour and peanut oil) with known aflatoxin content and has sent the samples to participating labs for analyzing the amount of aflatoxin. This will provide an opportunity to identify any additional steps, if needed with the labs so that to have results within a allowable range. A 2nd level survey has recently been sent out to find out what safety standards exist so far. The results will provide opportunity to come up with recommendations, if any, to improve the safe operating conditions and together steps for getting the labs certified. Once we gather that information, we will put together a list of available labs and the procedures offered. Second, we will compile standard operating procedures such as calibration comparisons and recommended best practices. The third outcome we will look at is safety procedures. Eventually, if we can establish standard testing and maybe a standard certification for the region, then we can work on increasing exports and improved trade opportunities. This blog was written by our colleagues at the Peanut and Mycotoxin Innovation Lab and originally appeared on their blog.